Analytical Scanning transmission electron microscopy (STEM) is a powerful technique for materials analysis and characterization. Z-contrast STEM images show atomic positions, as well as chemical composition information in the material structure. 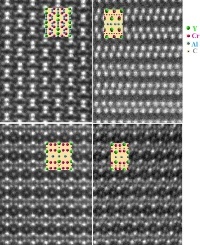 It can not only characterize the detailed atomic structures of defects, grain boundaries, interface structures,1 but also directly determine the crystal structures of new materials. To date, a certain number of new materials: Mo2Ga2C,2 o-MAX phases: Mo2TiAlC2, Mo2Ti2AlC3,3 Mo2ScAlC2, i-MAX phases: (Mo1.3Sc0.7)AlC,4 (Cr1.3Sc0.7)AlC, (Cr1.3Y0.7)AlC,5 Ti3AuC2, Ti3IrC2,6 … have been uncovered by STEM. 1.Lu J, Kota S, Barsoum WM, Hultman L, Materials Research Letters, 5 (2017)9 235. 2.Hu C, Lai CC, Tao Q, Lu J, Halim J, Sun L, Zhang J, Yang J, Anasori B, Wang J, Sakka Y, Hultman L, Eklund P, Rosen J and Barsoum MW, ChemComm. 51 (2015) 6560. 3.Anasori B, Halim J, Lu J, Voigt CA, Hultman L and Barsoum MW, ScriptaMaterialia 101 (2015) 5. 5.Lu J, Thore A, Meshkian R, Tao Q, Hultman L and Rosen J, Crystal Growth & Design, 17 (2017) 5704. 6.Fashandi H, Dahlqvist M, Lu J, Palisaitis J, Simak Sim Abrikosov IA, Rosen J, Hultman L, Andersson M, Spetz AL, and Eklund P, Nature Materials, 16 (2017) 814.